Extend your growing season by purchasing or building a high tunnel, also known as a hoophouse. These large, solar-heated greenhouses allow a farmer to increase overall yield and sell the harvest in months that are typically too cold to grow. A high tunnel often also turns out higher-quality produce. Extending the season and allow small farmers to produce crops in the off-season when demand is higher. Protecting crops from wind, low temperatures, and damage from birds and deer. Screens, if used, can help protect crops from insects. Reducing weed problems, as most crops are grown with plastic mulch and drip irrigation. Without natural rainwater, the soil in between crops is not overly moist, so weeds don't get started. High tunnels and hoophouses generally have ribs made of metal or PVC pipes and are covered with clear plastic. Crops are grown in the ground with drip irrigation. You can buy the frame structure and plastic of a high tunnel already made, with the cost ranging from $0.75 to $1.50 per square foot. However, you need to add an additional 25 percent or more for site preparation, water lines for irrigation, lumber for end walls, and other miscellaneous items. 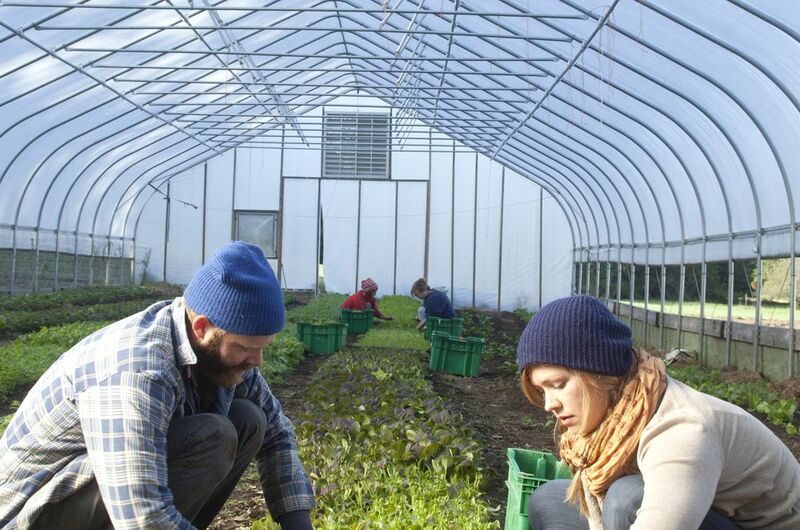 If you are the DIY type, you might choose to build your own high tunnel. You will still have to purchase the metal or PVC for the hoops, as well as the plastic. You can use various methods to anchor the high tunnel to the ground, to bend the hoops, and to secure the plastic cover to the hoops as well as allow for ventilation. Sizing a High Tunnel: High tunnels are typically 10 to 30 feet long, 8 feet wide, and 9 to 12 feet high with either 3- or 5-foot sidewalls. However, high tunnels come in many shapes and sizes and can have multiple bays that share sidewalls. They can also be built into hills or against existing walls. Placing a High Tunnel: The site for the high tunnel should be level, well-drained and easily accessible. You can move high tunnels as desired each year, or you may choose to keep the high tunnel in one location. If you are using the high tunnel in one location, plan to amend the soil each year to maintain fertility. You can also use raised beds or tables within a high tunnel (for example, you could grow microgreens or start seeds on tables in a high tunnel). North-south or east-west orientation for light is not as critical with a high tunnel as with a greenhouse. The main consideration is the direction of the prevailing wind on your farm. Because there is no automatic ventilation, the wind provides the ventilation for your high tunnel. The general recommendation is to orient the high tunnel perpendicular to the prevailing winds. High Tunnel Regulations: As a general rule, high tunnels are considered impermanent structures, so you probably won't need to get a permit. However, begin by checking with your local zoning regulator to find out what the laws are in your area.